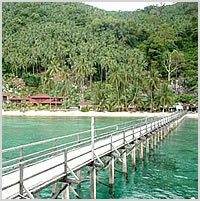 Pulau Aur is located around around 70 kilometers off the coast of Mersing, south of Tioman Island. The five kilometer long island is blessed with larger, pristine coral formations due to its greater distance from the mainland. It is also often visited by some big pelagics such as mantas and whale sharks. There are several surrounding islands and the deep water channels between them attract all manner of marine life. There are no dive operators on the island, everything must be pre-arranged. Sitting a fair distance, some 80km east of the Mersing jetty,are the islands of Pulau Dayang, Pulau Lang, Pulau Aur and Pulau Pinang. 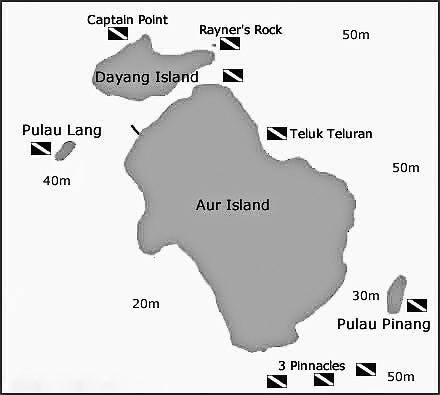 This cluster of islands is particularly difficult to get to -one reason being that the boats going to and fro are irregular and another being that many of the dive operators seem to have monopolised the islands for 'weekend' SCUBA divers. Pulau Aur has always been a stopover point for fishermen. With a supply of frsh water and plenty of fish in the waters, a few later moved their families to the island. However Aur was never the peaceful island as we see now. The deep dark secrets of the wild days are only beginning to unravel within the historic data collected from salvaged treasures hoisted from sunken Chinese junks, sailboats and old merchants ships found shattered in its watery grave. Today, not much of the tumultuous history can be traced from above the shoreline. Beneath, there are several wrecks that has been discovered and partly recovered but beyond the reaches of recreational divers. They are rumoured to contain treasures and wrecks beyond our imagination. Getting there : Boat from mainland 2 hours.